ESEE Cutlery ESEE 5P Fixed Blade autographed by NRA Executive VP Wayne LaPierre PLUS another (unsigned) ESEE 5P to use! One for SHOW, One for GO! The Second Amendment is not just about guns; it is about freedom, the freedom to own the "arms" we choose to own. Whether guns or knives, our founding fathers clearly intended that "the people" would be able to choose their arms freely and that this right would always be protected by the Second Amendment. Knives are man's most common tool, one ever present at hand of the brave men and women who wake up every morning and go to work to protect us. 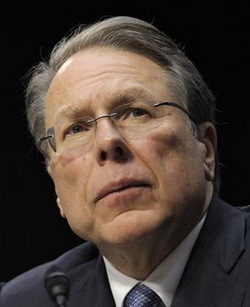 Knife Rights is the Second Front in Defense of the Second Amendment. They are the premier grassroots organization protecting our right to own knives. 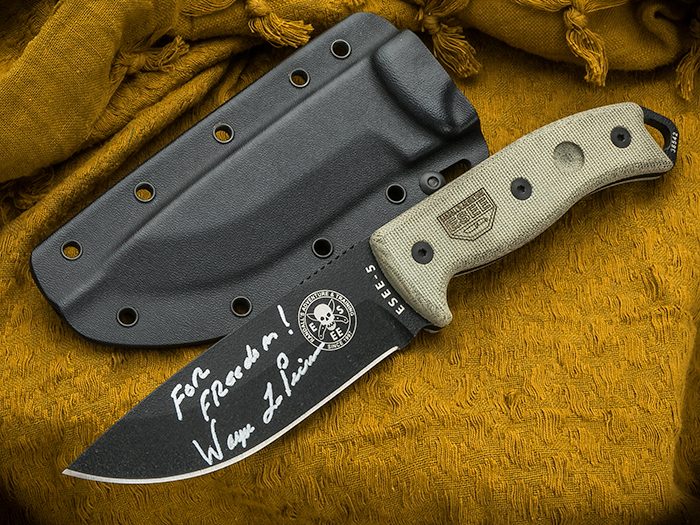 Those who love freedom need Knife Rights, so please join me in supporting their mission. The ESEE 5P ($188) was designed by Military SERE Instructors as a hard-use downed pilot's survival knife. The ESEE-5 features a high-quality Blade-Tech molded sheath. Each knife can be carried with the MOLLE back attached to the molded sheath or with the MOLLE back removed and the molded sheath attached via MOLLE locks.